Planely, the service designed to help you find out who else is on the same flight as you (thus maximising the chance to meet and network with new people) has just become more useful with the integration of LinkedIn. With Planely, you enter your journey details and it lets you know which other users will be on the same flight. Now, if your new matches have connected their Planely and LinkedIn accounts, a LinkedIn icon appears next to their name. When clicked, you get a neat summary of their professional life. Given that people tend to keep up-to-date CVs on LinkedIn, this is a great way of seeing just how worthwhile arranging a meeting with someone a the airport (or even on the plane!) might be. 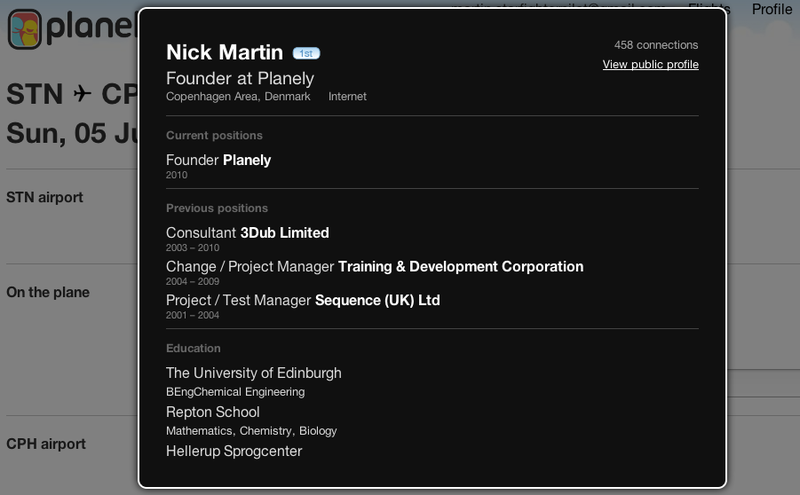 Planely CEO and founder Nick Martin explains, “The really interesting part is that if both you and your Match integrate, then as part of that summary we show you if your Match is 1, 2 or 3 degrees of separation away from you or in any of the same Groups.” Nifty.